Your implant-retained denture is an invaluable asset. It enables you to smile with confidence, speak with clarity, and enjoy all of your favorite foods without worry. Since it takes such good care of you, you should return the favor by taking good care of it. 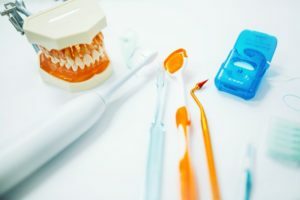 Here are some useful tips from an implant dentist in Randolph that will help you keep your denture clean and functional. Maintaining an excellent oral hygiene routine is pivotal for everyone, including those who wear implant-retained dentures. A failure to keep a clean mouth can allow bacteria to sneak beyond the gum line and damage the tissue that supports the implants. Over time, the infection can become so severe that it poses the risk of implant failure. Fortunately, cleaning your implant-retained dentures is a simple task that is easy to incorporate into your regular routine. If you have All-on-4 dental implants or another type of denture that is permanently fixed in your mouth, caring for your new teeth is similar to how you would care for natural teeth. Even though your prosthetic smile will never develop decay, you should still thoroughly brush and floss the teeth to prevent them from accumulating plaque, becoming discolored, or collecting odor-causing bacteria. It’s particularly important that you clean along the gum line. Gently brush the area, and then use an antibacterial, alcohol-free mouth rinse to give your smile an extra boost of clean. Also, you should clean beneath the prosthetic teeth. You can use a special, tiny dental brush to accomplish this or use a floss threader to get the floss into those tight spaces. If your implant-retained dentures are removable, snap them out of your mouth when you’re ready to clean them. Handle them gently as you brush the teeth. You should also brush the prosthesis’ underside, along the attachments that connect the denture to your implants. When you are not wearing the dentures, store them in water. Once a week, you can soak them in a denture-cleaning solution. Don’t forget to also clean the abutments in your mouth. You can do so using a regular toothbrush and toothpaste. Your dentist is eager to help you make sure that your implants and your dentures thrive. Visiting your oral health doctor every six months will give them an opportunity to offer friendly advice and reminders on how you can best care for your dentures at home. A professional cleaning of your mouth and the area around the abutments can thoroughly remove even the smallest food particles and keep bacteria at bay. A clean smile is a healthier smile! Use the above tips to protect your dentures and implants from infections, odors, and discoloration. Dr. Glen Goldstein is an experienced implant dentist in Randolph who is qualified to help his patients with every phase of their implant journey, from their placement surgery to maintenance of their new smile. If you have questions about how to care for your implant-retained prosthesis contact our office at 973-895-7995.